Apple today introduced the new Xserve, a 1U rack-optimized server that is up to twice as fast as its predecessor and includes an unlimited client license for Mac OS X Server Leopard. Starting at $2,999, the new Xserve has up to two Quad-Core 3.0 GHz Intel Xeon processors for 8-core performance, a new server architecture, faster front side buses, faster memory, up to 3TB of internal storage and two PCI Express 2.0 expansion slots for greater performance and flexibility. <‚ÄúWith the latest Intel processors and no client access licenses, Xserve offers unbeatable server performance and value for under $3,000,‚Äù said Philip Schiller, Apple‚Äôs senior vice president of Worldwide Product Marketing. ‚ÄúXserve‚Äôs power, storage and Leopard Server make it ideal for supporting Mac clients and mixed platform workgroups.‚Äù Xserve is configurable with up to two Quad-Core Intel Xeon 5400 series processors running up to 3.0 GHz with 12MB of L2 cache per processor and features a new high-bandwidth hardware architecture, dual-independent 1600 MHz front side buses and up to 32GB of 800 MHz DDR2 ECC FB-DIMM memory for a 64 percent increase in memory throughput**. Two PCI Express 2.0 expansion slots provide up to four times the I/O bandwidth of the previous Xserve to support the latest high-bandwidth expansion cards including multi-channel 4Gb Fibre channel and 10Gb Ethernet cards. Xserve now includes built-in accelerated graphics to drive up to a 23-inch Apple Cinema Display and a new front-facing USB 2.0 port. Using Apple‚Äôs Server Monitor, an administrator can remotely turn Xserve on or off and manage server software from anywhere on the network. Each of Xserve‚Äôs three drive bays can be configured with 73GB or 300GB SAS drives or 80GB and 1TB SATA drives, providing a mix of high performance and vast storage capabilities for a wide range of server applications. Apple offers a hardware RAID card option that delivers hardware RAID levels 0, 1 and 5 with 256MB of cache and an included backup battery for up to 72 hours of cached data protection. The Xserve RAID card delivers up to 251MB/s RAID 5 performance*** for the most demanding server workloads, without using a valuable PCI Express expansion slot. The new Xserve improves energy efficiency with Intel‚Äôs 45 nanometer core microarchitecture technology. The processors draw a maximum consumption of 80W, and drop as low as 4W when idle. Power supplies exceed Energy Star recommendations from the US Department of Energy and Apple‚Äôs thermal management technology cools the systems efficiently in a wide variety of environments while reducing power consumption. Every Xserve ships with a preinstalled, unlimited client edition of Leopard Server software, offering true 64-bit support, easy-to-use management tools and support for Mac¬Æ, Linux and Windows clients. Leopard Server is fully UNIX compliant and extends Apple‚Äôs legendary ease of use by introducing over 250 new features, including Podcast Producer, the ideal way to automatically publish podcasts to iTunes¬Æ or the web; Wiki Server, allowing people to collaboratively create and modify their shared web sites with just a few clicks; and iCal¬Æ Server, the world‚Äôs first commercial CalDAV standard-based calendar server. The new Xserve is shipping today and will be available through the Apple Store and Apple Authorized Resellers. In addition to the standard configuration, Xserve offers numerous build-to-order options and accessories including: dual 2.8 or 3.0 GHz Quad-Core Intel Xeon processors; 80GB and 1TB 7200 rpm SATA or 73GB or 300GB 15,000rpm SAS Apple Drive Modules; internal Xserve RAID card; Gigabit Ethernet, 4Gb Fibre Channel and U320 SCSI expansion card options, and a 750W redundant power supply. *Based on industry-standard SPEC jbb 2005 benchmark tests conducted by Apple in December 2007 using preproduction 3.0 GHz 8-Core Xserve units and shipping 3.0 GHz Quad-Core Xserve units. SPEC is a registered trademark of the Standard Performance Evaluation Corporation (SPEC); see www.spec.org for more information. Performance tests are conducted using specific computer systems and reflect the approximate performance of Xserve. **Testing conducted by Apple in December 2007 using preproduction 3.0 GHz 8-Core Xeon-based Xserve units and shipping 3.0 GHz Quad-Core Xserve units. All systems were configured with 8GB of RAM. Results are based on the STREAM v. 5.6 benchmark (www.cs.virginia.edu/stream/ref.html) using OMP support for multiprocessor-compiled builds. Performance tests are conducted using specific computer systems and reflect the approximate performance of Xserve. ***Testing by Apple in December 2007 using preproduction 3.0 GHz 8-core Xeon-based Xserve units configured with Xserve RAID card. Testing conducted using Iometer 2006.07.27 with a 30-sec ramp-up, 5-min run, 512KB request size, and 4 outstanding IOs. System configured with the OS and test volume on a single RAID volume. 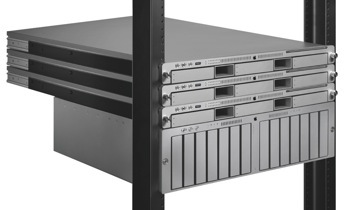 Performance tests are conducted using specific computer systems and reflect the approximate performance of Xserve RAID Card.